If you are in the beginning stages of starting a new business, you are likely adding more and more items to your to do list, Googling night and day, researching all the things and probably purchasing too many courses – – – and hopefully implementing like mad. I have spent years researching, learning. trying new things and oh yeah, also developing marketable skills, first while working full time in corporate during the day and working as a freelance writer/journalist at night and during weekends, then as a full time freelancer, then later as a full time social media consultant and LinkedIn coach for executive job searchers, working for many clients and now building my own blog from scratch, which I love. Along the way I’ve seen thousands of women just like you and me taking the leap to start their own business. Whether it’s blogs, Etsy or Creative Market stores, courses, VA services, affiliate marketing or consulting, there’s are plenty of different ways to serve your community and make money online. I know some course creators make it look like it’s easy and that everyone can do it, but most who stay in the game and make progress work hard and keep working hard. Not one course or expert has all the answers. We keep researching and implementing. I’ve got plenty of hacks I’m planning to share with you. 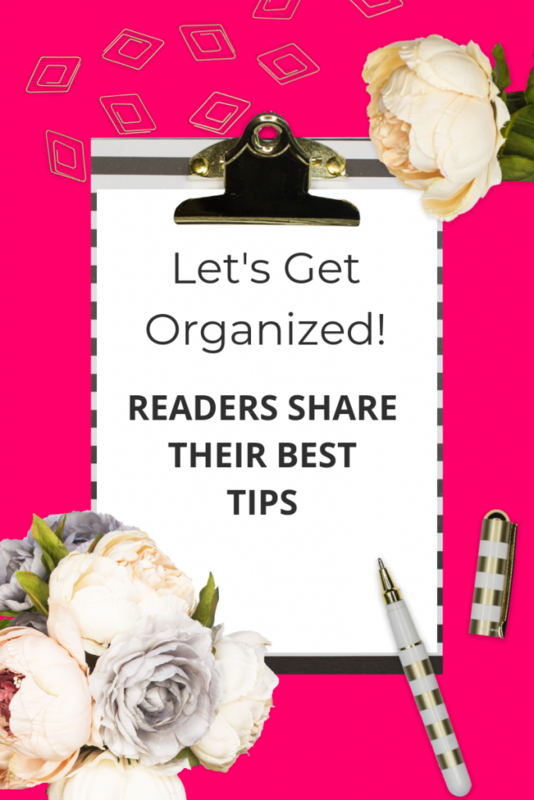 And I’m also collecting some of your best tips to help us get organized and more productive and to keep us inspired along the way. What’s Your Best Tip to Get Organized? Start the day prayers, gratitude and affirmations. Don’t forget say confidence affirmations. – Frankie M.
Remember your why – Why you are starting a business? to express creativity? to help your family enjoy a higher quality of life? to help others? – Jessica A. Tip #3. Don’t Compare Yourself. You will hear practically every single successful blogger tell you that they still have to tell themselves not to compare their business to a competitor’s. I love the way Suzi Whitford from Start a Mom Blog puts it: Don’t compare your Day 1 to someone else’s Day 1000. – Suzi W.
Not everyone is cut out to create a profitable blog or start an online business. Remind yourself that this is what you choose to do. Instead of saying, “I have to,” I say this instead: I get to … – Carrie T.
As a SAHM mom of two little ones, when I started taking on jobs as a VA, it became overwhelming. I know it sounds simple, but “Put things away right away” became my motto. Whether it’s picking up the toddler’s toys up before daddy comes home or making myself fold and put the laundry away as soon as it came out of the dryer, it helps me get a more realistic view of my time. I still struggle with this sometimes but I know I am also teaching my kiddos good habits. My 5-year-old now folds and puts away most of his clothes. – Christie L.
I’m a list maker. When my friend Michelle was getting ready for her daughter’s wedding, we started out with coffee and a list. Michelle didn’t work from lists. I told her, “Think big. Think of everything you’d like to get done for the wedding, even if you don’t think it’s possible.” It was my job to keep Michelle on task. We had a fun day, just two good friends taking the entire day – through lunch and dinner – to leisurely complete and check off every item from the list. – Vicki S.
To combat overwhelm, get enough sleep. Turn off all the social and Netflix and go to bed one hour earlier. Amber K.
Establish a simple morning and evening routine to set the tone for the day and the next day. – Kailie R.
To keep a clear head, ff you can do Inbox Zero, select and archive all your gmails every morning so you can at least see Inbox Zero lol. – Amber L.
Tip #9: Stop Buying Courses! Make this a no-spend month when it comes to courses. Pick one course and IMPLEMENT everything you can before you purchase a new course. – Tamra C.
Take at least one day off of working. Remember why you are doing this. To have a better life. – Jill T.